Welcome to my new weekly series: Book Club Picks. 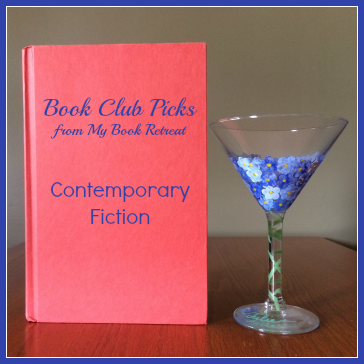 This week, I'm sharing some Contemporary Fiction novels that would be great choices for a book club discussion. I think the two most important aspects of a book club pick are that 1) it appeals to the entire group, or at least the vast majority, and 2) it has something "meaty" to discuss. There are many great books that don't offer much in the way of discussion points. The following contemporary fiction novels will give you plenty to talk about! Told from the perspective of three moms, this novel will give book clubs much more to discuss than the transition to kindergarten. Themes include domestic violence and bullying, the politics of the schoolyard and the difficulties of parenting after a divorce. This novel will prompt discussions that focus on marriage and parenthood, but go much deeper into the idea that things are not always what they seem. Conjoined at the head, Rose and Ruby are never apart physically, but they are two unique individuals inside. This novel will give book clubs plenty to discuss, including the difficulties of being an outsider in society, the bond of sisterhood, and the themes of individuality and identity. Additional discussion can be made around the way it's written: as Rose's autobiography, with occasional chapters added by Ruby, who reveals things Rose isn't openly sharing with the reader. Here's another novel that gets into the nitty-gritty of marriage and motherhood. This one is told from the perspective of Alice, a 39-year-old woman who suddenly forgets the past decade of her life, missing the births of her children and the changes her life and marriage have experienced. Book clubs can talk about Alice's disbelief in how her life has changed over the past 10 years, and discuss the way their own lives have changed in that time. Topics of marriage, parenthood and infertility are all covered within this novel. This is a novel that gets into some difficult topics, including the struggles of the poor, the sacrifices we make for our families, and the controversial topic of assisted suicide. Book clubs can discuss the devastation of Will's accident and the way he reacts to being stuck in a wheelchair after living such an active life. They can discuss the choices Lou makes for her family, and the effect Will and Lou have on each other. This novel can lead to some "What if?" types of questions where book clubs can discuss what they might do if they were in different characters' situations. For book clubs looking to discuss family dynamics and the effect of parents on their children, this is a great choice. Told from the perspective of two sisters, the book gets into their individual relationships with their father and the immense impact he has had on their lives ~ in very different ways. Other themes in the novel include one sister's transition into high school after being sheltered her whole life and the other's determination to stand up for herself. Next week, I'll be sharing some 19th Century Historical Fiction novels that would make great choices for book club discussion. Please let me know if you have suggestions for other topics to cover, or if you would like to write a guest post for my Book Club Picks series. I'd love to hear about your book club! Adding these to my to read list! Love this. If you can't tell - I love book lists. ;) This makes me happy! Especially since I haven't read 3 out of 5. Wow! You need to get reading! Well, now you have a few books to read. Glad you like the new series! I'll be in touch about that guest post! !